It’s a tough time to be a fan. I have two shows that I absolutely adore, and both of those shows delivered a gut punch last week that left me reeling. The Magicians season finale saw the death of one of my favorite characters (and half of my favorite ship) and it was both excruciatingly well done and absolutely heartbreaking (and maybe a bit problematic too). 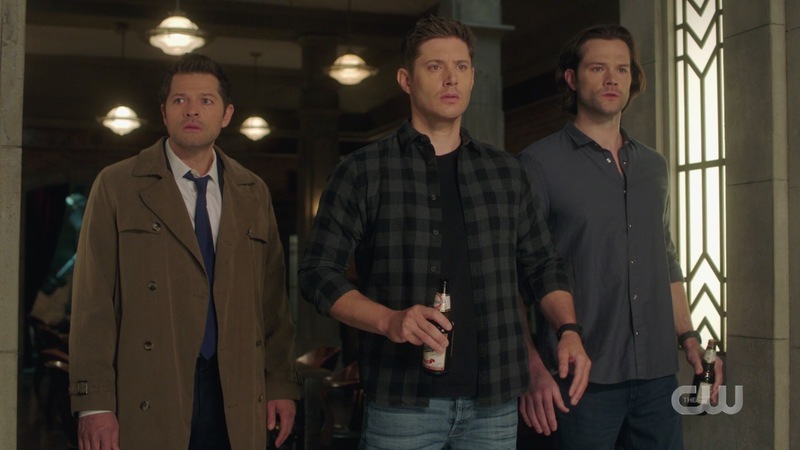 The very next night, Supernatural aired its penultimate episode of Season 14. I was already raw from the anticipatory grieving about Supernatural ending this time next year, and then The Magicians ripped me apart, so I went into watching “Jack In The Box” with more trepidation and dread than anticipation. To those of you saying hey, why can’t you just watch the Show and love it? Let me just say that I would give ANYTHING to be able to do that right now. I DO love it, I will always love it. What I really want to do is squee about it all the time. But last week’s episode left me feeling sad and vaguely sick to my stomach, so there’s not a lot of squee to be had right now. I always go back and do a rewatch before I write my review, but today I found every excuse not to. Have to run out and pick up the ham for tomorrow’s dinner. Have to grade some papers. Have to clean….and water the plants (we have lot of plants, so that took alot of time)…have to…. Finally I couldn’t put it off any longer, and the rewatch made me feel every bit as sick to my stomach as the first watch did. I guess you can say that means the episode was well done, because it was clearly crafted to be upsetting (just as the episode before was crafted to be very sad), but when I don’t want to watch it, I’m not sure that’s the level of upset the Show was going for. We’ve known the episode title for quite a while, so everyone knew that Jack was probably going to end up in that goddamn box, but I for one didn’t want to believe it. The Ma’lak box was so profoundly upsetting to the fandom when Dean was determined to get in it, and his nightmare so horrifying, that the thought of Jack in that box was almost unthinkable. So I guess I chose not to think about it. Still, as the ‘Then’ segment started, a chilling dread began to settle over me. Please Show, don’t go there. Please? Let me just say at the outset that all the actors outdid themselves. They all played their parts incredibly well and every one of them made me genuinely feel. It wasn’t always what I wanted to feel, but feel I did. Robert Singer directed (and had a cameo as a doctor) and that was also as well done as always. The VFX was on point and the cinematography and set dec were often breathtakingly beautiful. I appreciate my Show even when I’m reluctant to go where it’s taking me. We open with a memorial service for Mary in the bunker. 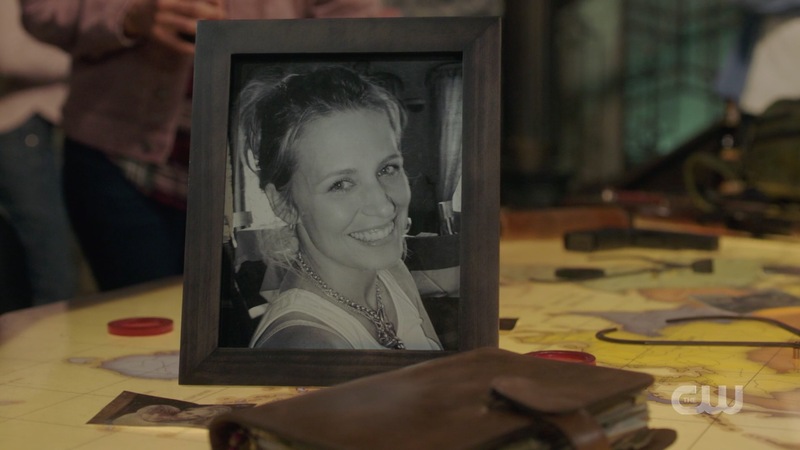 The AU hunters and other people who’ve hunted with her are there, her photo (or rather Sam Smith’s photo) and John’s journal on the table. 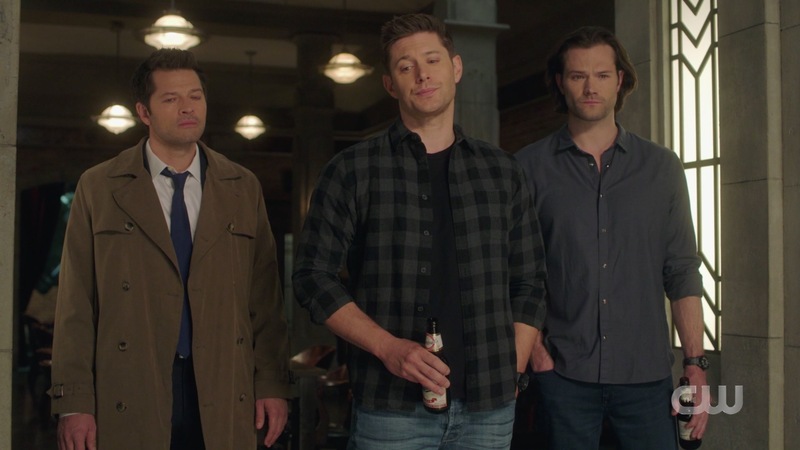 Sam, Dean and Cas join the group but only Dean speaks. 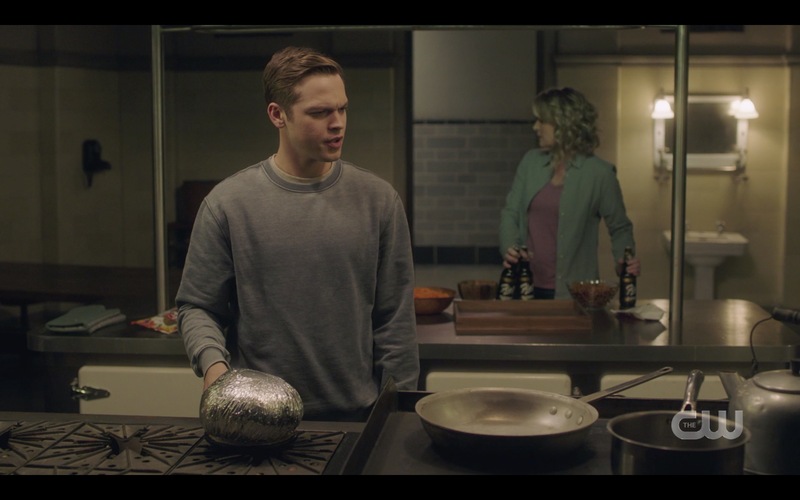 He’s carefully composed, makes a joke about Mary’s cooking even, while Sam stands silent, nodding in agreement. 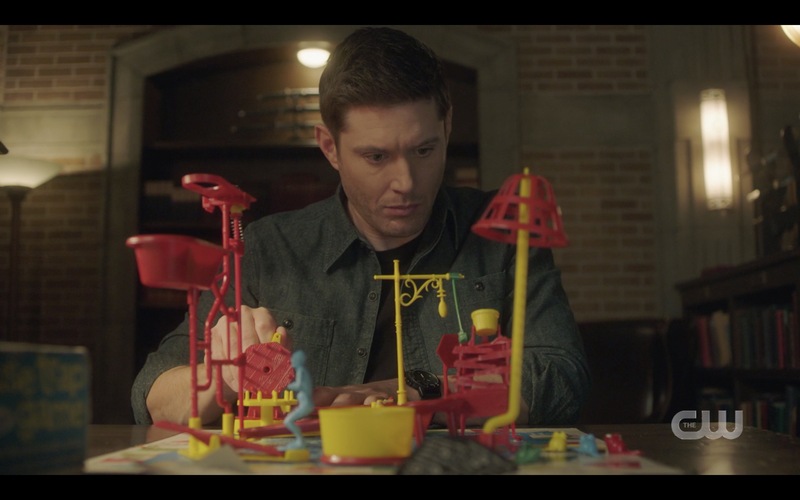 It’s something important to remember when you look at Dean’s behavior in this episode. There’s this thing with grief that’s called the “fishhook effect”. A new loss “hooks into” all the old loss and pulls it up like a fish snagged on a line, so that the pain of the new loss brings up all the pain of the old one and it’s overwhelming. 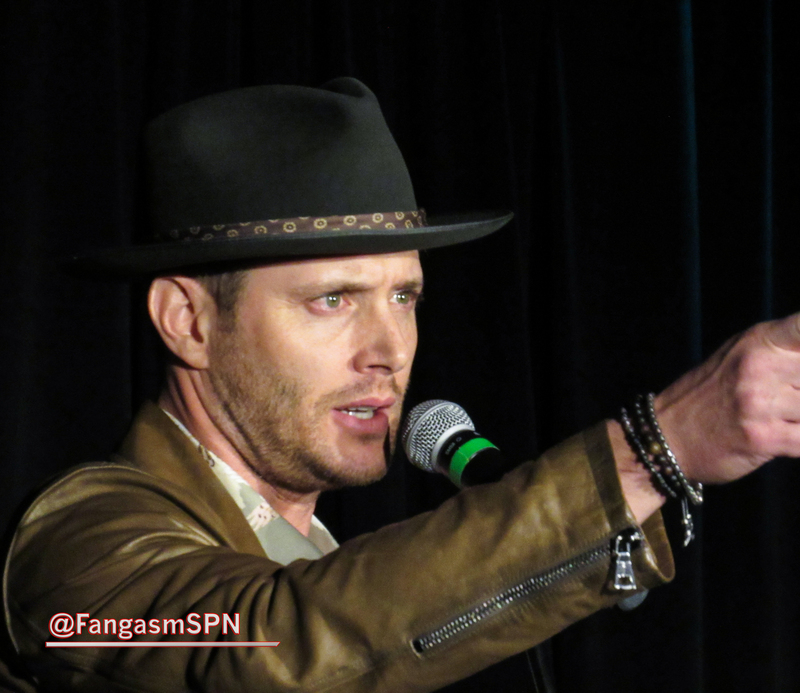 That’s what happens to Dean here, I think. Unlike Sam, he remembers the horrible pain of losing his mother as a four year old, something that has shaped his life ever since and left him with a reservoir of anger that he’s channeled into making him an often ruthless hunter. Dean expresses their gratitude that they got to know her and what she was really like, a smart and stubborn hunter who couldn’t cook worth a damn. 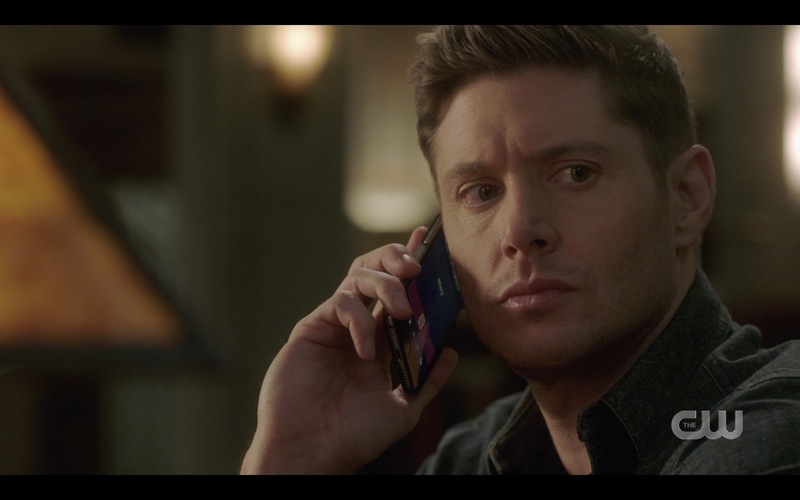 Dean: Mom, you weren’t here long enough…. But we’re glad for the time we had. There’s a weird and jarring moment in the middle of all this where AU Bobby suddenly appears and tosses a hatchet across the room to kill one of the guests, who apparently is a wraith, but WTF? It was all very odd. That’s for sure because Bobby doesn’t seem very torn up at all for someone who was maybe kinda sorta having a bit of a thing with Mary. At any rate, it’s soon clear that something is up with Dean. 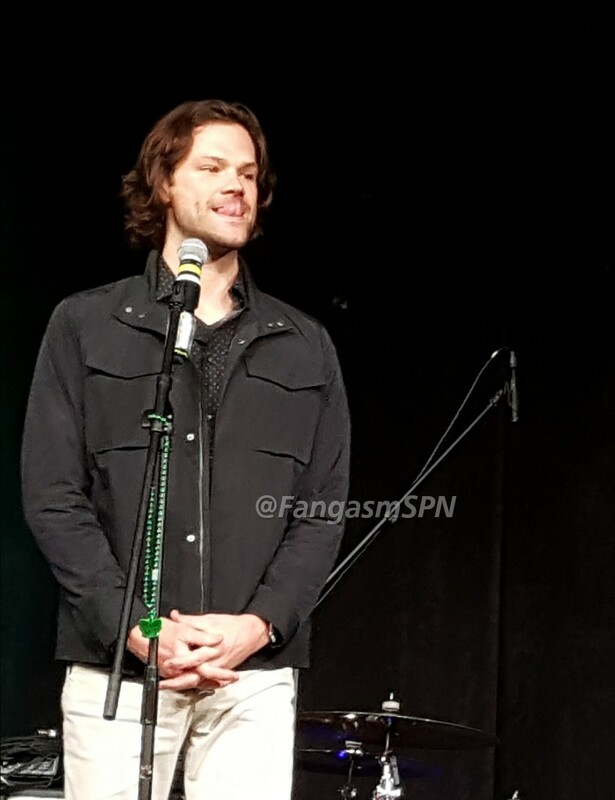 Sam suggests they open Ketch’s bottle of Scotch and hang out and talk about Mom. 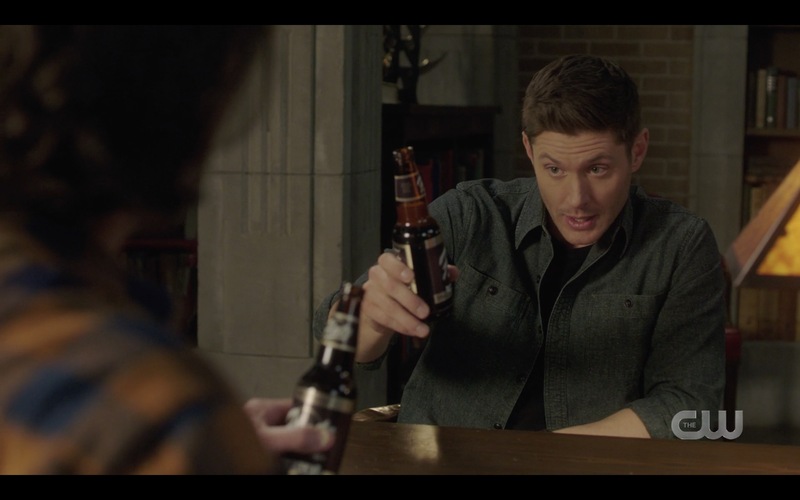 Dean: (almost coldly) Talk about Mom? Isn’t that what we’ve been doing? He boxes things up with steely motivation, like he thinks he can just box up his grief over losing his mother (again). 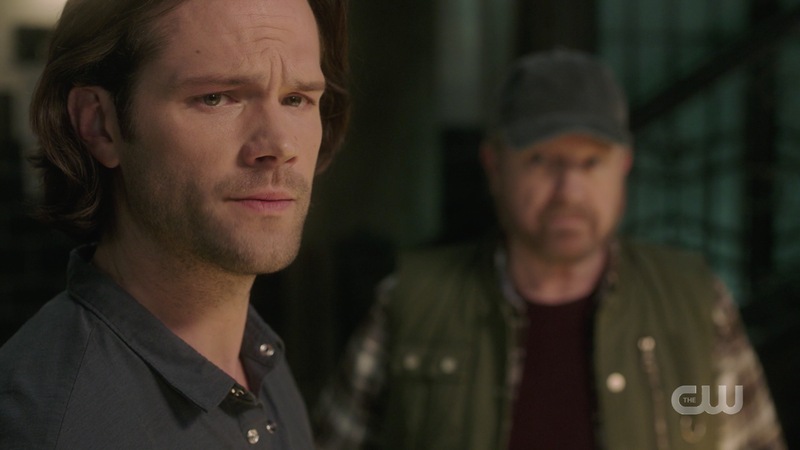 Courtesy of that grief and loss course I’m currently teaching, Dean and Sam struggle to understand each other in this episode or to be there for each other because they have two very different styles of grieving. Sam is an intuitive griever – he wants to express his grief and share his feelings, eager to take in the comfort of others. 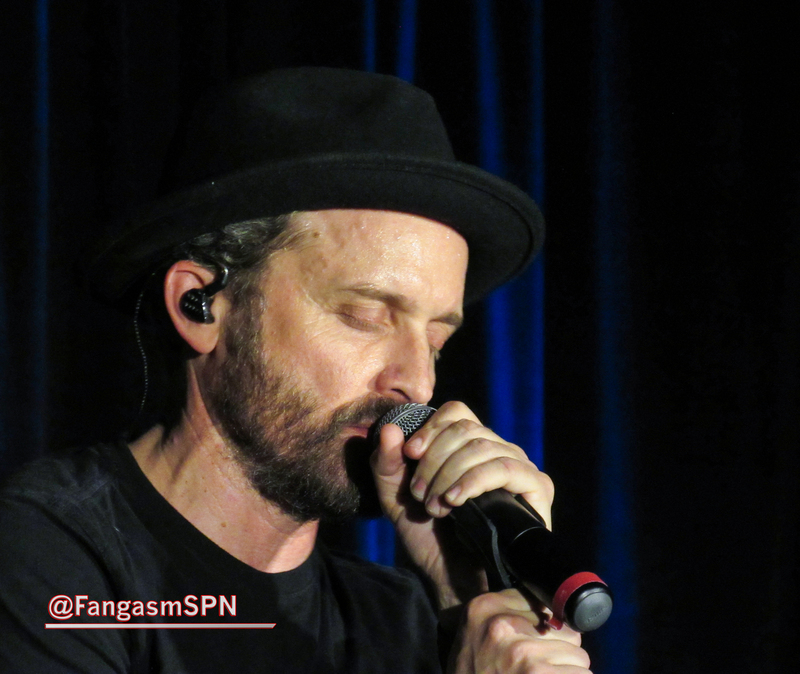 Dean, on the other hand, is an instrumental griever. He keeps his feelings to himself and tries to DO something instead – like plan a memorial and box up his mother’s things. Neither can help the other right now, and that’s heartbreaking. 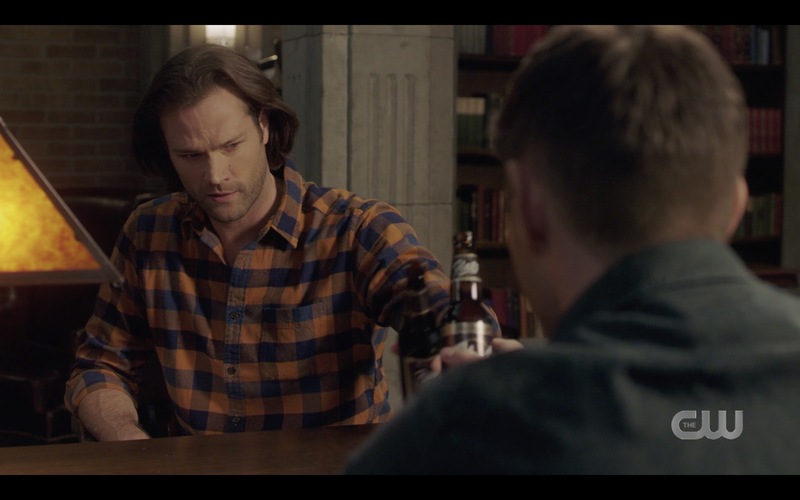 Cas, Sam and Bobby break out the Scotch as Sam looks at one of the very few (only?) 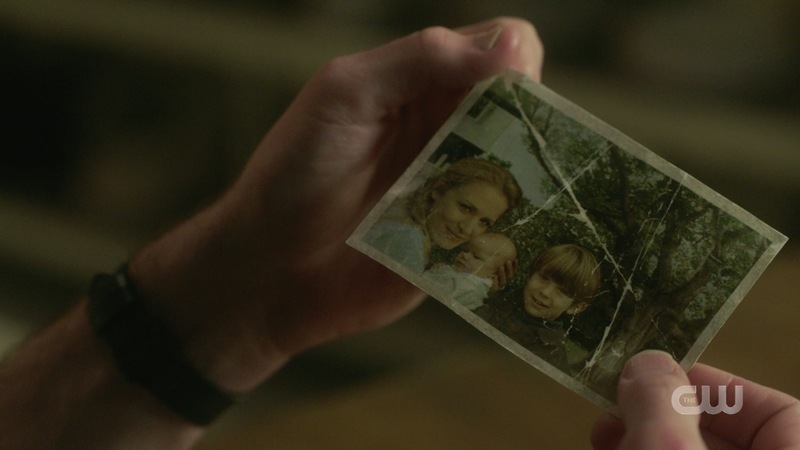 photos of him, Dean and Mary when they were little. They disagree, however, about what to do about Jack. 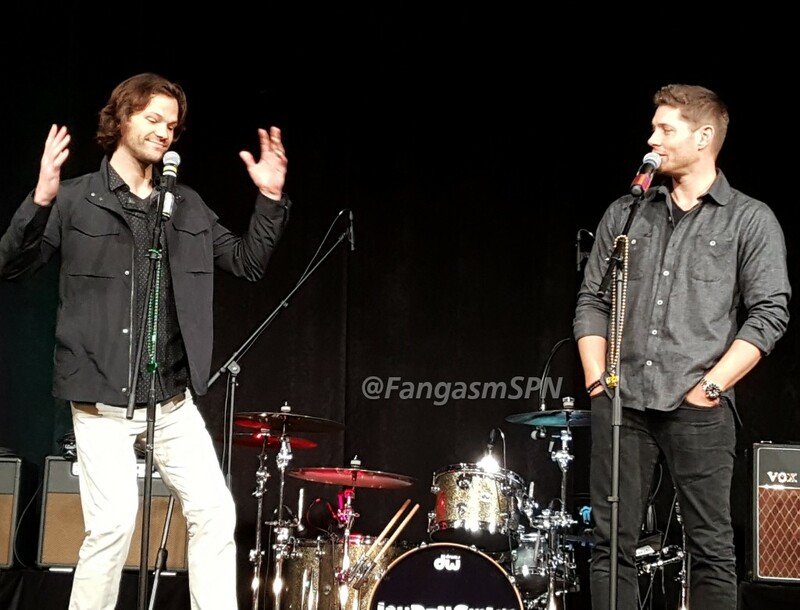 Cas: We need to find Jack…and help him. 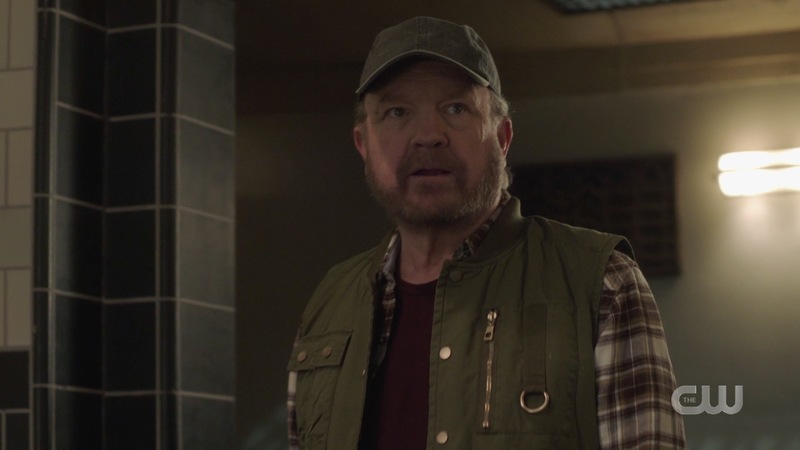 Bobby: I liked the kid… but if his human side is gone, he’s an unstoppable monster who don’t know right from wrong, and he needs to be put down! 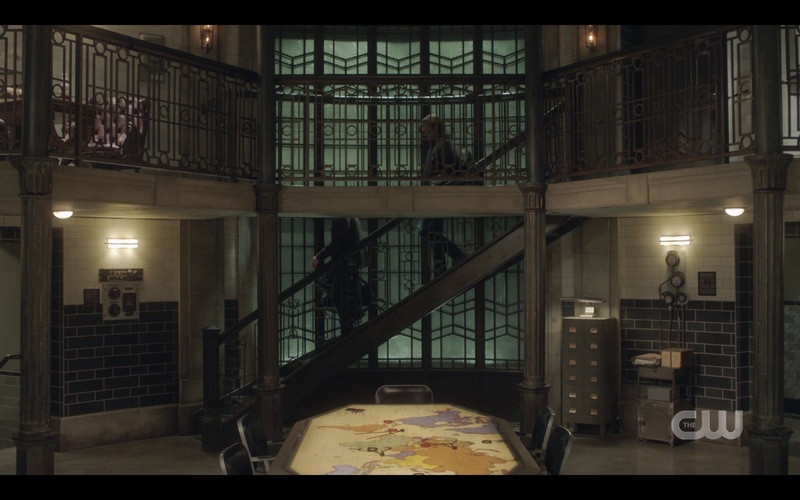 Bobby sets off to do just that, and Dean takes off saying he needs to get out of there. 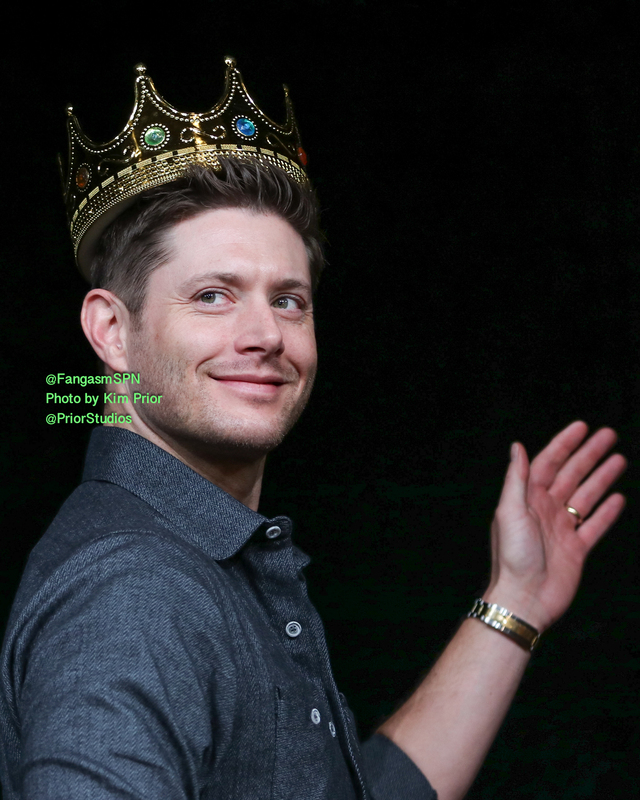 When the next scene opens, we see that Dean has parked the Impala in the woods and is sitting alone on a fallen log. He looks around one last time to make sure nobody is watching him, and then he finally breaks down. 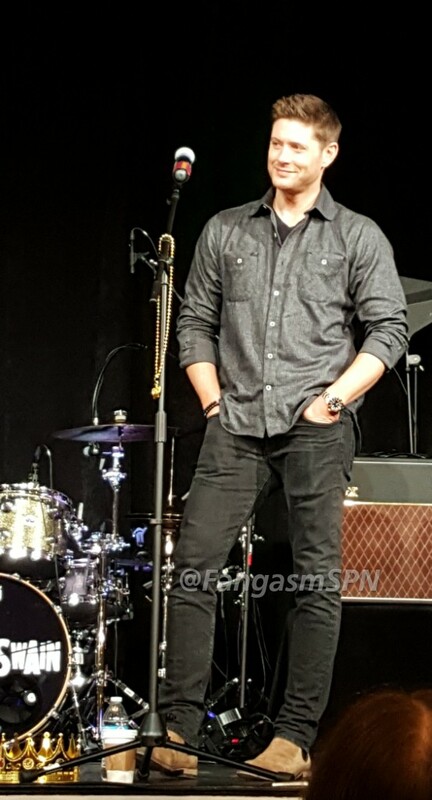 Jensen Ackles can make you believe grief like no one else, and he sobbed for real here. I can’t help but wonder if he was crying real tears knowing he will be losing Dean Winchester soon, the way so many of us keep crying. At any rate, it was a heartbreaking scene. Ackles talked about it at a recent convention, saying that it was a brutal scene to film because it was cold and pouring rain and they needed to shoot from above so there couldn’t be any shelter for him. It sounded like it took a long time to film, so it’s sort of a shame it was so short. It got the point across though. Dean is hurting – BAD. He just can’t let anyone know it. And what is the most common ‘cover’ emotion when someone is hurting that badly? You guessed it. Anger.